The often ignored and underrated album in The Beatles canon makes it all the more interesting to listen to as opposed to listening to "Sgt Pepper" again. In many ways it is a John Lennon album more than it is that of any of the others, particularly in its three opening tracks. Lennon's cynical approach to love and romance is becoming notably clear. The music has many country-ish rhythms and it is often described as The Beatles' "country album", although it contained a few rock'n'roll covers too. It was also supposed to herald the first signs of Lennon's "Dylan influence", although I think using a harmonica on a song is stretching the point a bit. Overall, though, it displays some mature pop songs, some lyrical cynicism, some acceptable covers and hints at a clear change in direction, attitude and ambience from the unbridled fun of 1963. It is a far more credible album than those that went before but it has to be said that it is still just a thirty minute collection of two minute 60s pop/country rock/rock n roll songs. I own both the mono and stereo remasterings and have to say I prefer the stereo. The sound quality in general is excellent. Listen to the drums and acoustic guitar on "Every Little Thing" - clear, sharp and full simultaneously. Ditto the guitar and percussion on "What You're Doing". You can't beat these latest stereo remasters, in my opinion. 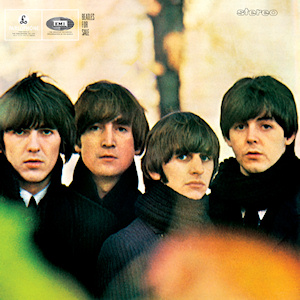 With "No Reply", the album begins with Lennon in resentful mood against his girl, against a country style largely acoustic backing and some powerful drums from Ringo Starr. A somewhat low key, downbeat introduction to the album, given that contemporary trends often saw an upbeat toe-tapper opening things. However, for me, it is a highly credible rock song. In "I'm A Loser", Lennon injects a little self-loathing into matters. Pure teenage love songs like "She Loves You" and "I Wanna Hold Your Hand" seem a long time ago now. Some critics have suggested that this is a Bob Dylan-influenced song. It maybe so, but personally I don't really see it. It contains some vibrant percussion from Starr and some harmonica too (hence the "Dylan period" claims, I guess), plus some rocking guitar too. For me this is all far too fast-paced and country "poppy" for Dylan. He was still in his slow acoustic poetic protest phase. This is a country-tinged rail about the singer's problems in love. Not really the same thing. "Baby's In Black" completes this intriguing opening trilogy - it gets even darker, albeit against a singalong country-ish air, "oh dear what can I do...". The lyrical content is certainly more moribund than it ever had been before. Certainly Dylan had showed that "pop" music need not always be about happy young people in love, although even Frank Sinatra had shown that in his "torch song" period. In many ways Lennon was building on that, and on the somewhat downbeat nature of the second half of the "Hard Day's Night" album, such as "The Things We Said Today", reflecting the disillusion with relationships that seemed to increase as one matured. The mood gets lifted with this rollicking, upbeat cover of Chuck Berry's "Rock 'n' Roll Music". Lennon on vocals for the fourth track in a row. It is most enjoyable, possibly more upbeat and attacking than Berry's slightly slow-paced, unusually lazy original. Lennon just sounds as if he is really enjoying himself. Finally, McCartney appears in "I'll Follow The Sun" - a short, pleasant ditty with its Buddy Holly-style guitar part. Apparently it dates from the group's 1960 Hamburg period. In many ways it sounds like it too. It sorts of sits uneasily with the more mature approach of the earlier material on the album. In "Mr. Moonlight" Lennon is back on throaty vocals for another cover of an old country song. The guitar riff, in one part, was surely used by Blondie on 1978's "I'm Only Touched By Your Presence Dear". A thumping bass drum from Harrison, for a change. All seems a bit of studio messing around, to be honest. This and the previous track are the two "fillers" on what is, otherwise, an interesting album. "Kansas City/Hey Hey Hey" sees McCartney on vocals for this very credible and enjoyable rock'n'roll double cover. The band are energetic on this one, and sound as if they're having a great time. This cover works and brings the album back on track. 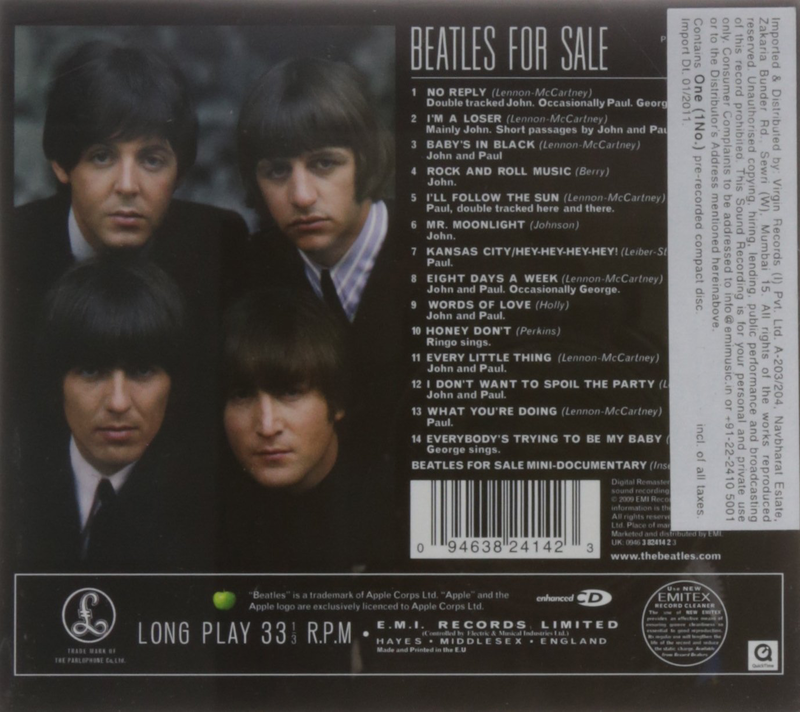 "Eight Days A Week" is probably the only accepted, recognisable Beatles classic on the album. John Lennon on lead vocal in a song that has a great guitar riff and a quintessential 60s guitar pop sound. It is mid-60s Beatles to a tee. Paul McCartney always loved Buddy Holly's music and this "Words Of Love" is one of The Beatles' finest covers, up there with the original. George Harrison absolutely nails the guitar part. I really like this, just lifts the spirits every time you hear it. Lovely bass from McCartney as well. A similar, cheering effect is achieved by Ringo's vocal take on "Honey Don't", a Carl Perkins slice of country rock'n'roll. Starr's vocal delivery is fetching as to are his exhortations to Harrison to "rock on George, one time for Ringo". Some have said this is a rather tired effort, again, personally, I disagree. I think it's great. Now it is time for a few original Lennon/McCartney songs, and "Every Little Thing" is a good one, with a convincing Lennon vocal that is clearly far more positive and optimistic about his girl than the first three tracks on the album. I like the booming bass drum punch from Starr too. "I Don't Want To Spoil The Party" is a Lennon/McCartney song but it is the obviously country & western-influenced song on the album, so much so that one almost expects to find out that it was a cover. Melodic, jaunty and enjoyable. Pretty light though. In "What You're Doing" Starr's excellent rumbling drum intro brings in this upbeat McCartney vocal with a Byrds/Searchers-style jangly guitar riff. Classic 60s guitar-driven pop in many ways. Nice bass sound and good production all round. A quirky little drum and bass guitar interplay at the end. The album closes with "Everybody's Trying To Be My Baby" with George Harrison on lead vocal for this fast-paced rockabilly rush through another Carl Perkins song. This is a pretty credible cover, but by now, other songs on the album have made you think that The Beatles could, and should, have done better than this.